Published: Aug. 12, 2014 at 10:24 a.m. 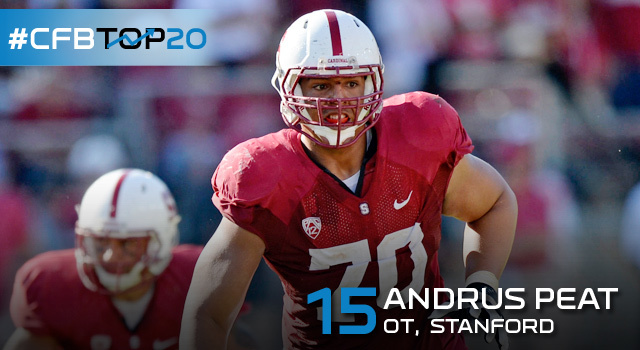 Updated: Aug. 12, 2014 at 11:22 a.m.
Andrus Peat has the prototypical left tackle's size and the athleticism to play tight end (seriously, he has lined up there at times). Peat is like many of his fellow Stanford linemen in that he can maul you on run plays, but what makes him special is the light feet and excellent hand placement he displays when pass blocking against premier rushers. No wonder his coach thought he could be a once-in-a-generation-type talent and possibly the best to play in the conference at the tackle position since Jonathan Ogden. Peat might be the least known of the players to make our top 20 list, but he is anything but anonymous with our panel. He was as high as fourth on one voter's personal top 20, and only two didn't find a spot for him. Where do fans rank Peat? We asked Twitter and Facebook users who they considered the best player in college football. No surprise that Peat didn't receive a vote among the more than 19,000 votes cast. Offensive linemen can walk down the street and not be recognized, even on their own campus.